November | 2013 | Yo, Yenta! In case you missed it, here’s my local take on the Chanukah/Thanksgiving mash-up in the current Connect Savannah. Hope to see some of you braving the chill for the Torch Relay on Wednesday afternoon! 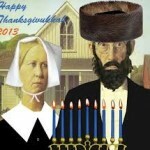 Oh, you thought we were done with Thanksgivukkah ranting? Please. We have eight nights to fill. I get that Thanksgivukkah bridges the non-Jewish gap and gives us more opportunity to reach out to the wider community, instead of just being those weird neighbors with the blue lights. I even wrote a resident-Jew piece about it for the day job (to be posted tomorrow at noon.) And mostly I like mash-ups, even if they involve Andy Griffith and Beyonce. But not this one. 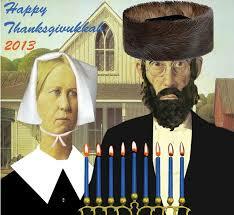 To all y’all who have embraced Thanksgivukkah, I appreciate your verve and honor your delight. Me, I love Chanukah, I love Thanksgiving. But melding them together like this in some quasi-dunking-of-latke-in-the-pumpkin/pumpkin-in-the-latke situation is just too much pressure. 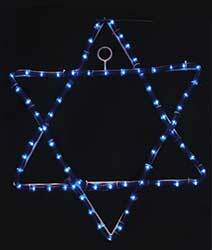 Chanukah Decor: Go Big and Get a Free Gift From Zion Judaica! Oh damn you lunar calendar, I just scraped the jelly skeleton off the storm door and now it’s time to decorate for Chanukah already? There’s still wax on the bookcase from last year! I just pray that the next time this happens in the year 79,811 (or something like year 83,582 in Hebrew) someone has invented a robot that cleans the ceiling of our descendants’ underground pods after the GMO-free potato-latke-frying and inevitable cranberry sauce explosion. First, I am rebelling against my spartan childhood where every house on our suburban block sparkled with fake snow and festive glare except ours. Second, 2 for 1 LED garlands at Rite-Aid. 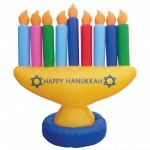 Sommer reminds us that even though Chanukah usually falls closer to Christmas, it’s not a competition. But listen, my bubbie, who wore full-on costume jewelry sets and gloves just to go to the Winn-Dixie, taught me to go big, and a whole house done up in blue on a crisp, cold night is just so gorgeous. I haven’t quite gotten into the world of inflatables yet (that spartan childhood will always have its hooks in my psyche,) but should I ever garner the chutzpah to 11-foot bear holding a dreidel in my yard, Zion Judaica is the hook-up. Orders usually ship between two and eight business days, with express options. Hurry up, we’ve only got two weeks to make the neighborhood shine! We have a Torah in the ark at Congregation Mickve Israel that comes from a trove of over 1500 scrolls recovered from Prague after WWII. Known as “The Holocaust Torahs,” they had been gathered up by Czech Jews as the Nazis made their horrific way across Europe and stored in a “museum” for the Germans. Most of those brave souls perished in Terezin and Auschwitz, but the Torahs survived and were moved to London in 1964. Our Torah comes from the little Bohemian town of Slany, about 12 miles northwest of Prague, and was scribed in 1890. 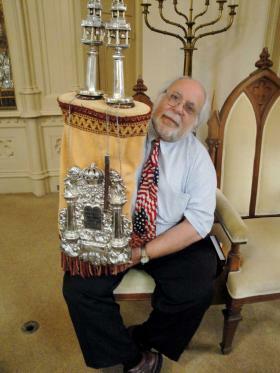 Indeed, it has played a prominent and meaningful part of Jewish life in Savannah since it arrived in 1968: The Slany Torah is carried through the sanctuary and read from every Saturday. It’s recently been refurbished and re-koshered in Florida, thanks to the efforts Phoebe and her husband, Jules. 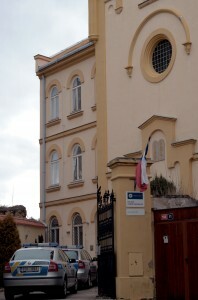 The former synagogue in Slany, Czech Republic, now a police station. And thus began the adventure: Historian and Sunday School teacher supreme Teresa Victor found that the Jews of Slany has been expelled in 1458 but returned a few hundred years later to build a prominent synagogue in 1865. That part of Europe was never particularly friendly to our kind, and the population declined by 1930. In 1942, the remaining 81 Jews in Slany were rounded up for the camps. There are no Jews there today. The former synagogue now houses the police department. This plane came from a squadron known as “The Mighty Eighth,” founded in Savannah and referred to as “the greatest air armada in history.” The Eighth’s soldiers earned 17 Medals of Honor, 220 Distinguished Service Crosses, 850 Silver Stars, 7,000 Purple Hearts 46,000 Air Medals — and also suffered half of the entire casualty of the entire war. All were American heroes, and eight of them began their last journey from right here in Savannah, Georgia to die fighting in the town of Slany. The Slany memorial to the fallen soldiers of the Mighty Eighth Air Force, based out of Savannah, GA.
Our rabbi Robert Haas traveled there this summer to see it, and all of us are marveling at the serendipity: Savannah honors its Slany Torah, and Slany honors Savannah’s fallen soldiers. This Saturday for Veterans Day weekend, Mickve Israel is holding a special Shabbat service at the sublime chapel at the Mighty Eighth Museum (which happens to be one of the most stupendous installations in the land.) The Slany Scroll will be there; reservations are required. So how’s that for interconnectedness? Some may call it coincidence, others the work of the Divine. All I know is that the next time Little Yenta Girl is called up to undress the Slany Torah, her hands had better not be sticky.